Twenty-five cents, and not in great shape, but well worth the effort it took to restore the awesome jacket art (I'm a sucker for the TV-screen motif) and the terrific tracks. A good number of clicks and pops (or "ticks," to use the elitist term), but VinylStudio cured most of those, and the rest I spliced out on MAGIX. 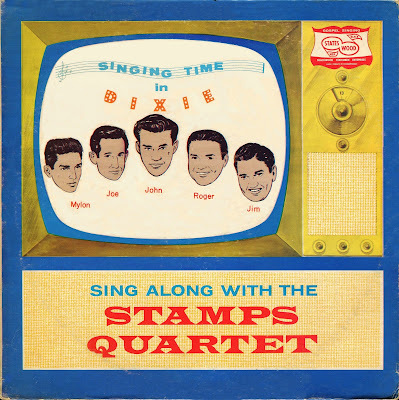 The result is quiet, first-rate mono sound from, I'm guessing, the early 1960s. The Stamps Quartet goes back to the 1920s, and this LP features the group's theme song, Give the World a Smile, near the start of side two, though it doesn't include the writer-composer credits (which are, Otis Deaton-words; M.L. Yandell-music). 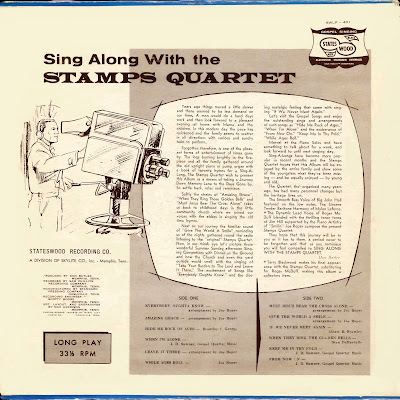 This seems to have been standard gospel-LP practice when it came to public domain material--here, we get arranger credit but no authors for the out-of-copyright titles--and I don't know if playing dumb on the p.d. titles was laziness on the part of the labels or an attempt to give the impression that the older material in question was somehow specially associated with the group. Anyway, I've added the text-music credits for all of the P.D. tracks, save for Amazing Grace, whose tune has no known authorship, and Everybody Oughta (sic) Know, a version of The Lily of the Valley which mostly uses Charles C. Converse's tune for What a Friend We Have in Jesus. I've never known quite what to make of that one. I have it in at least one songbook--one which I can't locate at this moment. 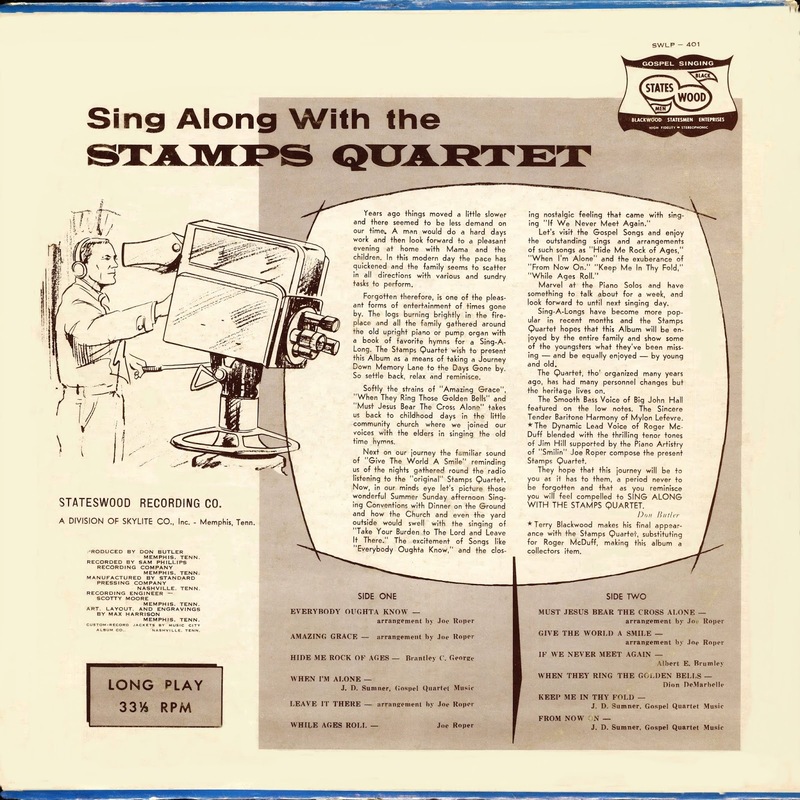 With these issues out of the way, here's a lot of terrific, old-style quartet singing, with an especially superb bass, performing in a style not massively far removed from the group's 1920s sound. Three J.D. Sumner compositions, and Sumner is always the guy associated with this group, though his association appears to have only begun in 1962, some time after the outfit started. Don't ask me. My quartet knowledge isn't all it should be--I'm mostly busy making the surviving flea market and thrift examples look and sound as good as possible. Hope I did justice to this gem. Oh, and the piano solo version of When They Ring the Golden Bells is a classic--with its tempo shifts and dramatic flourishes, it could have served as a silent movie background. Weird in a good-weird sort of way. Hi Lee, this looks great. Apparently Sumner started as their manager in 1962, but didn't join the group until 1965. 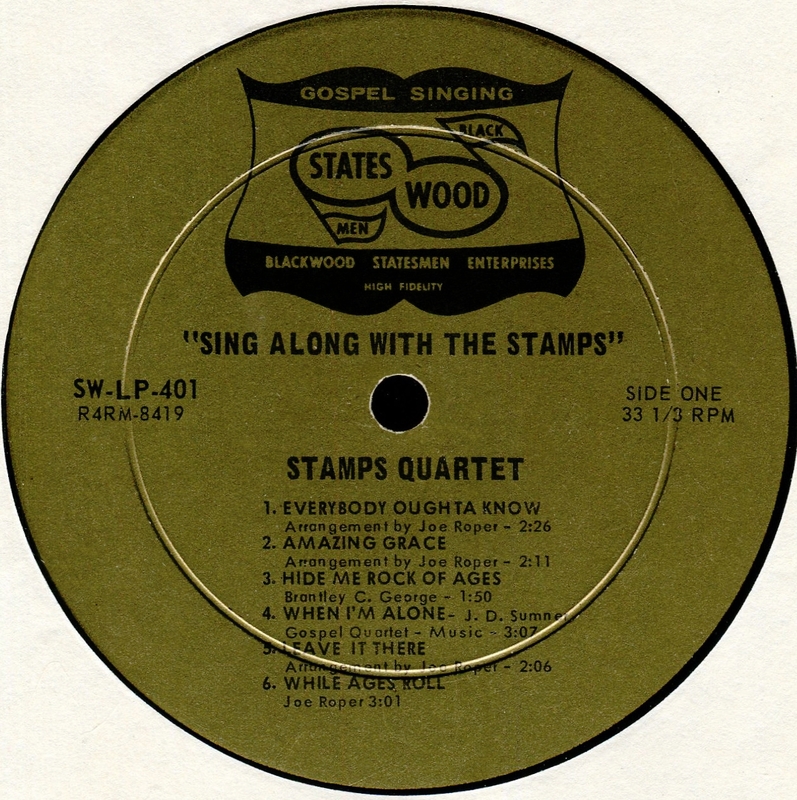 The LP cover says that Terry Blackwood is the lead and that it is his last record with them, but he didn't join them until 1962. Given that Sumner doesn't sing on the LP, that would date it from probably 1963 or 1964.